Recently I’ve had a lot of people contact me about upcoming plans to visit Madrid! Obviously, this makes me extremely excited and eager to brag about my favorite Spanish city, but if I’m being honest, it’s been really REALLY hard to narrow down all of the things that make me love Madrid so much! I decided to make a “One Day in Madrid” plan to try and focus on all of my favorite things, but I came to realize that one day in this amazing city, well, it’s just simply not enough. Still, I realize that not everyone has the opportunity to wander Madrid’s streets for a full two years, and so my task began. In my personal opinion, Madrid is a hard nut to crack. It’s a very unique European capital. It doesn’t have an Eiffel Tower, a Big Ben or a Coliseum. It’s not bursting from the brim with exciting crowded attractions and long lists of must-see sights. Instead, it has a very specific character and a very special feeling, ones that are sometimes difficult to translate to visitors who don’t truly have enough time to crack her code. I’ve been trying to figure out a way to share my beloved city. A way for others to see her beauty as I do. I wish everyone had the opportunity for a prolonged stay, to discover Madrid’s charm for themselves, but the sad truth is that is rarely possible. So I thought and I thought hard. If I only had 24 hours more in Madrid, this is how I would want to spend it. I wouldn’t spend my day waiting in lines or rushing in and out of museums. I would want to taste Madrid’s culture, wander her streets and once more feel her one-of-a-kind charm. Without further ado, here is my perfect day in Madrid. 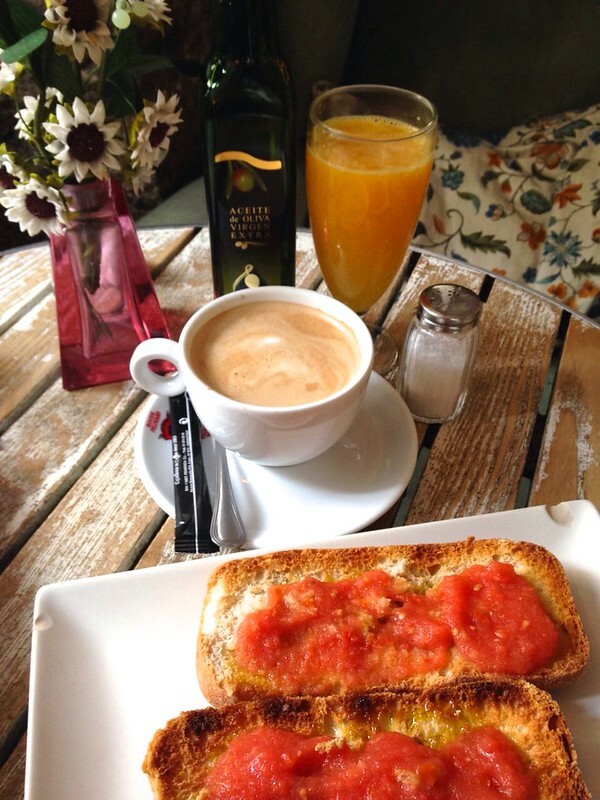 Start off your day like a real Spaniard by treating yourself to a helping of ‘tosta con tomate’ or toast with tomato. It may seem a little weird to be eating crushed tomato at such an early hour (I know it was at first for me), but give this typical Spanish breakfast a try! Sprinkled with a little salt and olive oil, this has turned into one of my favorite morning meals! One of my absolute favorite things to do in Madrid is simply wander, or as many madrileños put it, ‘dar un paseo’ (go for a walk). I realize that with such little time in any given city, aimlessly wandering is not at the top of every travelers list, but, I truly feel like this is one of the best ways to really get to know Madrid. If only just one hour, allow yourself to let go a little bit and let your curiosity lead you. (Also be sure not to get too lost by keeping some landmarks in mind!!) Pop in and out of corner shops. Sit in a plaza for second morning pick-me-up. Admire the many residential balconies overflowing with vibrant blossoms. Walk around and get acquainted with the REAL Madrid. 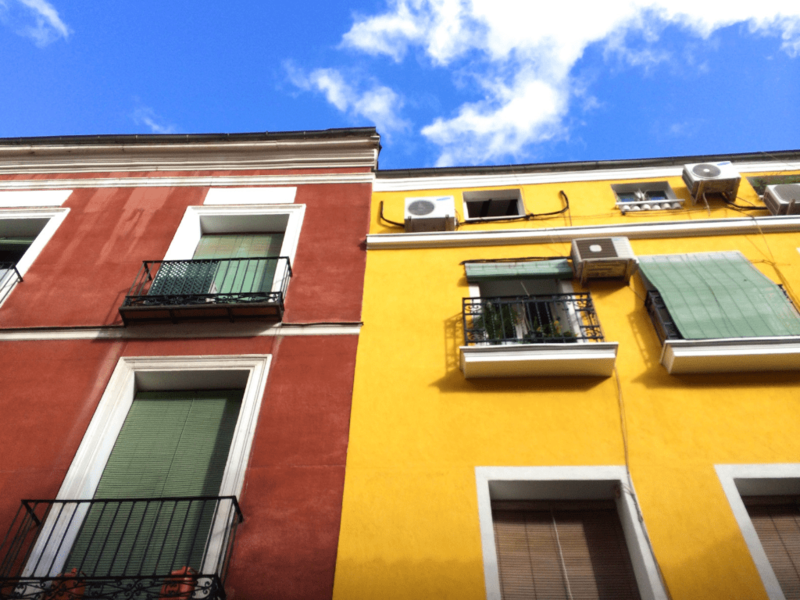 Chueca– Madrid’s ‘gay’ neighborhood. Very trendy, inviting and charming! 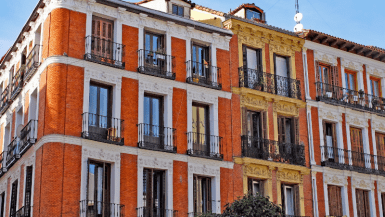 La Latina– Traditional Madrid. 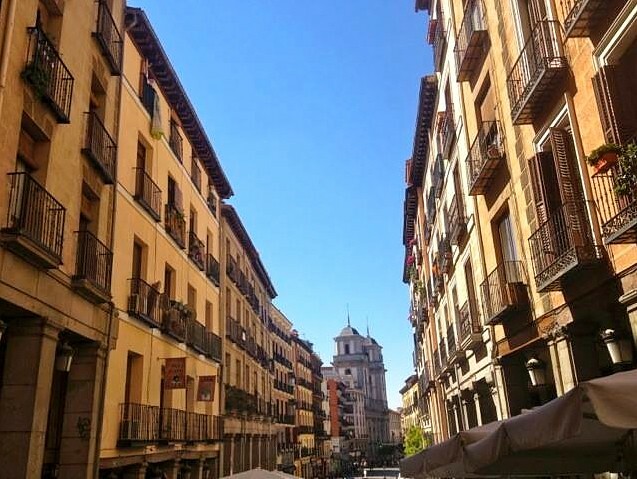 Tapas bars, old buildings, winding streets and authentic feel. 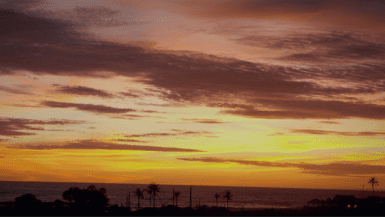 Las Letras– This neighborhood is directly in the center, but not too touristy. Filled to the brim with history, especially literature. Famous literary quotes and colorful bohemian art line the cobblestone streets. Salamanca– Posh luxurious neighborhood with fancy restaurants and designer shopping. 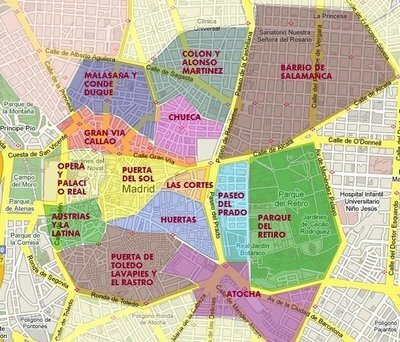 Want to know more about Madrid’s neighborhoods? Go to this link and then click the neighborhood you’re interested in for more in-depth info! If you’re a returning reader to my blog, you know one of my favorite ways to familiarize myself with any city is to taste it. Just in time for Spain’s merienda, take some time to pass through one of Madrid’s many colorful markets. There are traditional markets all over Madrid boasting stalls of authentic Spanish delicacies including jamón serrano, Spanish tortilla, patatas bravas and varieties of pinchos and tapas alike, as well as specialized international stands. Allow yourself to indulge in a few small bites, but try not to fill up too much as lunch is not too far away. 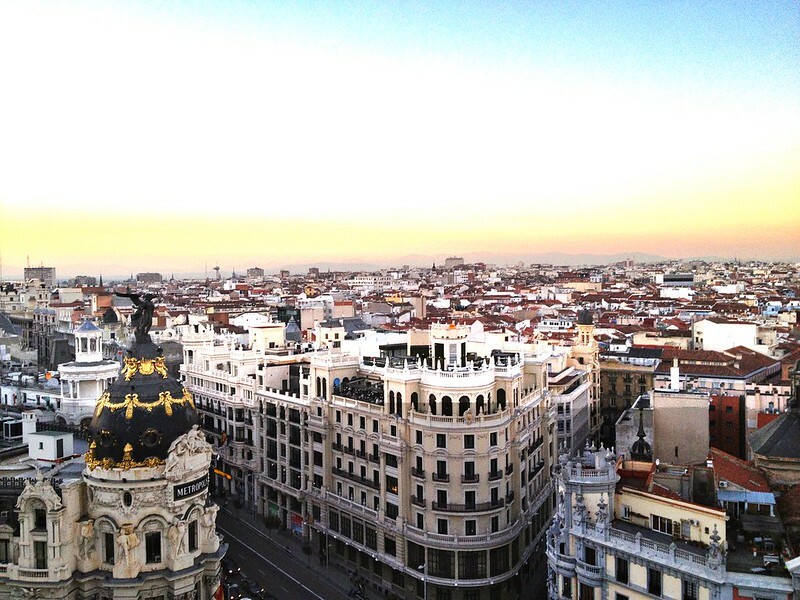 “De Madrid al cielo.” This quote literally meaning “from Madrid to heaven” claims that once you’ve seen Madrid, the next best thing is that idealistic euphoria we all dream of. AKA nothing tops Madrid. What can I say …. I agree. But seriously, gazing down at Madrid from above, well there’s not much else like it. This city is known for its picturesque bright blue canopy sprinkled with fluffy cotton clouds. Its low laying buildings even allow us to take in the Sierra de Guadarrama mountains, truly yet ironically a heavenly backdrop. 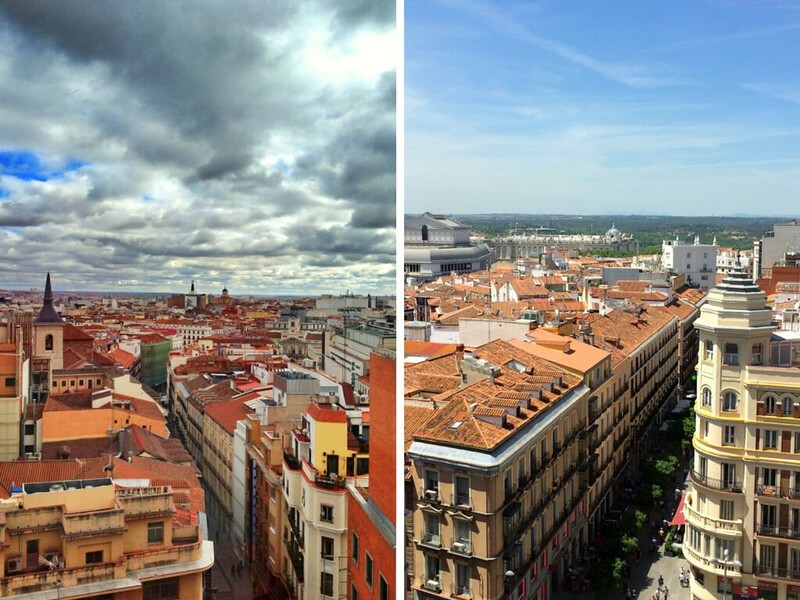 *Be sure to check opening times as most rooftops in Madrid are seasonal. Hopefully you kept yourself under control in the markets, and still have room for what the Spanish consider the most important meal of the day- Lunch! You may be thinking 2PM is a little late for lunch, but here in Spain this is the norm. Lunch in Madrid is usually served anywhere between 2PM-5PM and is the largest meal of the day. Below I’ll give two very different yet very typical Spanish options for lunch, depending on what you’re looking for! Whichever option you choose– Take your time. Savor every bite. Crack a bottle of Spain’s finest. Enjoy the people around you and lose yourself in the conversation. This is how Spaniards do lunch and in my opinion, it’s the best way to do it. 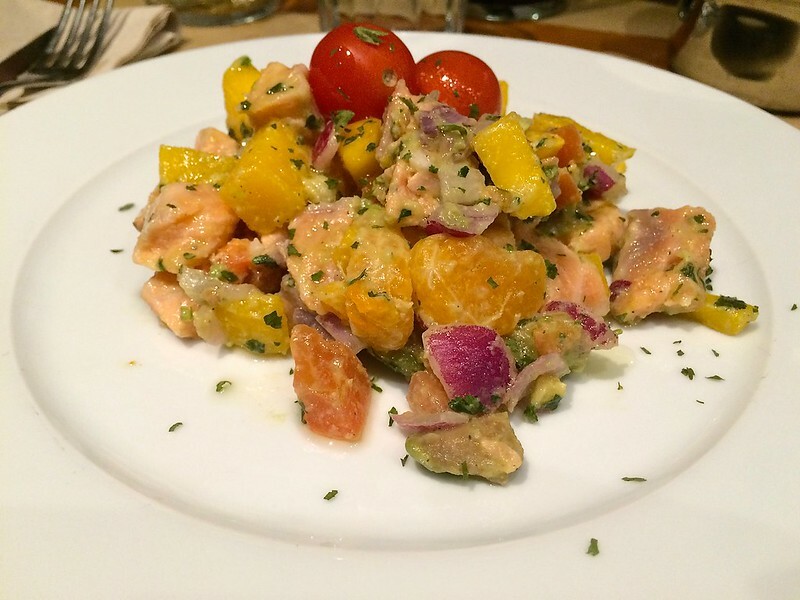 The Spanish “menú del día” is not the typical menu us English speakers immediately think of. Instead this “menu of the day” usually consists of a three-course prix-fixe meal including a “primero” (starter) a “segundo” (the main dish) and a “postre” (dessert), often accompanied by your choice of beverage and bread. These menús are usually only offered during lunchtime on weekdays. When it comes to Spanish dining, this is the best quality meal you will find for an amazing value and will cost anywhere from 8-15 Euros. The nice thing about Momo is that they offer their entire “carta” (English menu) during their midday prix-fixe. Most restaurants change their menu del día daily, which can be a nice experiment but also means it’s sometimes a gamble as to what you will get. Well, with Momo I’ve tried it all and it’s all amazing. Their modern twist on traditional Spanish flavors is damn well delicious. Momo’s regular menu is actually a bit on the pricey side, but their menú del día comes out to 11,50! Another very typical Spanish option, although not as common in Madrid, is to do a tapas crawl. Unlike in the South of Spain, tapas are not usually free and are paid for in Madrid. Still, that doesn’t mean you can’t have the typical Spanish tapas experience. The most famous street for trying these tasty little plates is just outside of the center on Calle Cava Baja in the La Latina neighborhood of Madrid. This little street has the most bars per square meter than any other street in the city! Not too long ago, I designed the first post in my “Madrid series” which was a DIY walking tour of Madrid’s center sights. After lunch is the perfect time to take on this tour as you should be fueled, energized and ready to go! 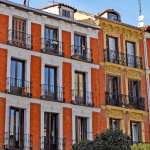 Madrid is a city with many things to do, but there are also many things to see that don’t necessarily have to be ‘done.’ What I mean by this is that you can very much enjoy yourself by simply exploring Madrid’s streets and taking in the sights from afar, rather than paying to enter them! This tour covers all of my favorite sites including the well known Plaza Mayor, Royal Palace and Puerta del Sol passes through Plaza Cibeles and ends up right in my favorite park, Retiro! 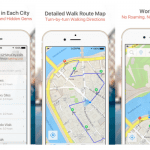 Find a link to my walking tour here! My DIY walking tour will drop you off right in Retiro Park, which is not only the most well known park in Madrid, but also my favorite! This park, literally meaning “Park of the Pleasant Retreat,” was once hogged by the royal family, but is now thankfully open to the public. Surrounded by luscious open greenery you’ll completely forget that you are smack in the middle of the busy Spanish capital. 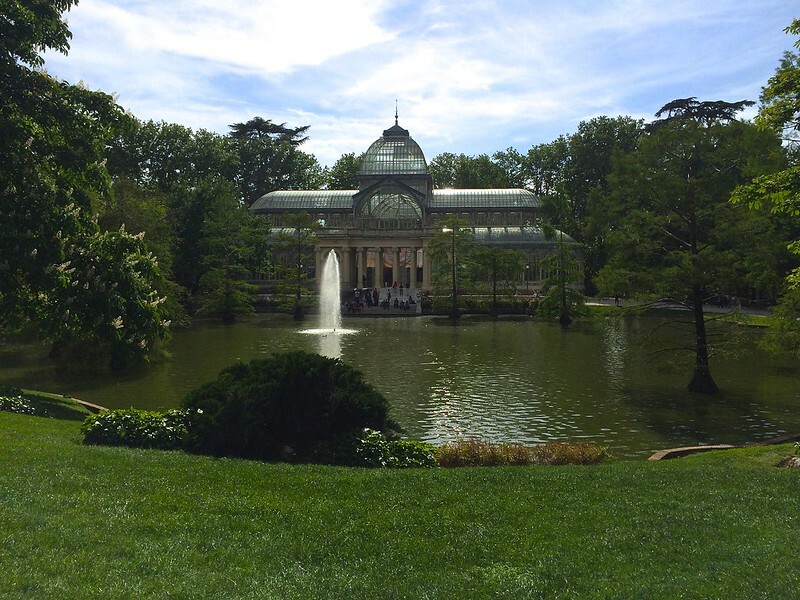 Home to alluring galleries, extraordinary monuments and sculptures, a tranquil manmade lake, an exquisite crystal palace, intricate gardens and a variety of fountains, I could explore Retiro for hours. In the intense heat of the afternoon, after all that eating and walking, you deserve to relax in the fresh air of Retiro. Calle Gran Vía is Madrid’s main vein connecting many popular neighborhoods of the city and running directly through the center. It is know by some as Spain’s own Broadway and is home to grand hotels, theaters, restaurants, brandname stores and a lively nightlife scene. Gran Vía truly has something for everyone! Take a stroll down this lengthy luxurious street admiring elegant 20th century architecture while window shopping (or actually shopping) and people watching! * If you’re looking to shop you’ll find a range of stores suiting all tastes and budgets. Keep a eye out for popular Spanish clothing brands such as Springfield, Pull & Bear, Bershka, Sfera, Blanco, Stradivarius, Massimo Dutti and Desigual. Look for the colorful Schweppes logo and you’ve found Plaza Callao, a landmark of the city and sometimes referred to as the “Times Square” of Madrid. 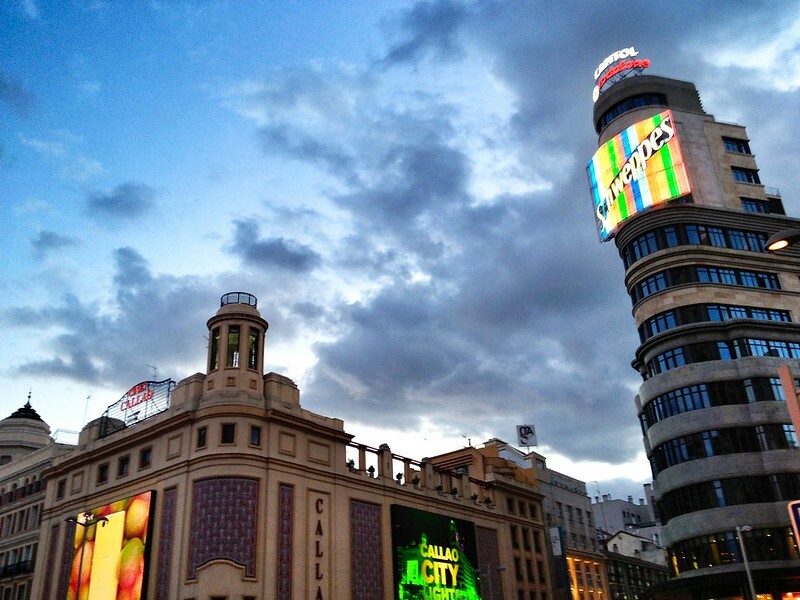 Callao sits right at the heart of Madrid’s cinematic and theatrical scene, along the infamous Gran Vía. 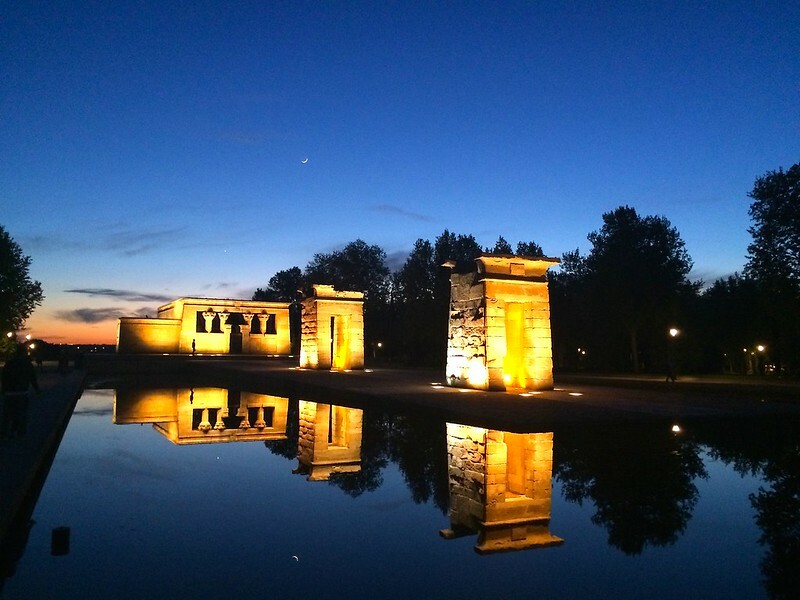 A stunning sight that should absolutely not be missed during a trip to Madrid is the Templo de Debod Sunset. Crowds gather to the railings in front of the temples to bid the sun goodbye as it creeps its way over the Madrid horizon. While the sunset is an incredible vision, I love to hang around about 20 to 30 minutes after the sun’s disappearance, when the crowds begin to disperse and dusk has prepared to fall. Just before the sun has truly kissed the sky goodnight, you will encounter a captivating scene- the reflection of the temples in the surrounding pool. In the inducing dark of night the water appears as a thin sheet of glass mirroring the Egyptian structures before you. Truly breathtaking. ***Note: Don’t forget to check the time of the sunset and adjust the schedule accordingly!! Lateral is my go-to restaurant whenever I have visitors (or whenever I have a craving, which is often). Lateral’s extensive menu has a plate to please every pallet. They focus on modern Spanish tapas, toasts and ‘raciones’ to share. 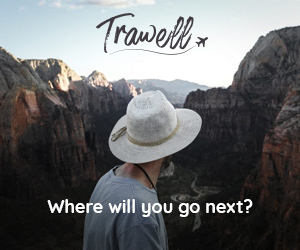 With a few locations throughout Madrid, there should be one close by, wherever you may find yourself. The atmosphere is young and lively, the food is affordable and delicious and the drinks are generous and refreshing! 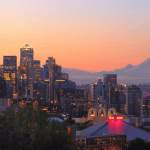 It’s no surprise that this popular place is always packed, but don’t let that discourage you! The turnover is very quick! Order one of Lateral’s fancy flavored mojitos! 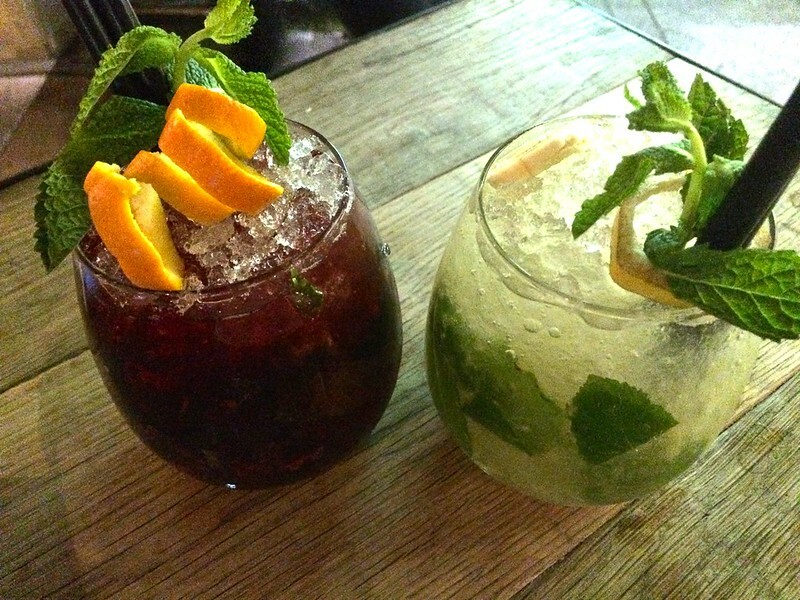 Next to the main bar is a side bar specifically dedicated to the crafting of these scrumptious drinks and unlike a lot of Spain, each is prepared with fresh fruit and mint instead of a sugary syrup! At only 7 Euros a piece they are a real steal! Some of my favorite typical Spanish dishes at Lateral are the Rabo de Toro, the croquetas and the Rollito de Salmon! English menus are available so there is no confusion when choosing dishes! Don’t let a long wait turn you away! I’ve been told up to an hour and a half and have never waited more than 15-20 minutes. Put your name and head to the bar for a drink, you’ll be seated before you know it! Feeling up for a late night snack? 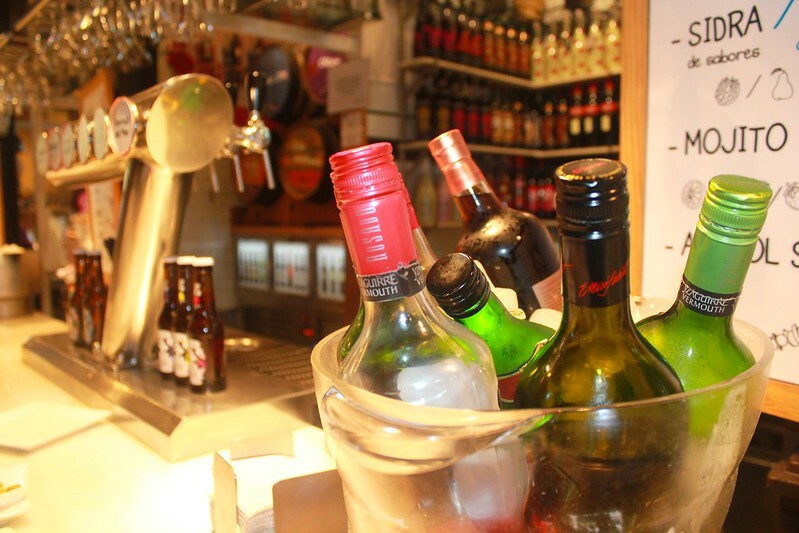 After paroozing a bit of Madrid’s nightlife head on over to the famous chocolatería, San Gines! This little local churros joint is open 24 hours and although usually pretty crowded, it’s worth the wait! These are still the best churros and chocolate I’ve had in all of Spain so far, and I’ve eaten my fair share of churros! Go to see Madrid’s beloved Real Madrid or Atletico kill the game, as usual. See a bullfight. (Eek). Find tickets here. In Madrid on a Sunday? 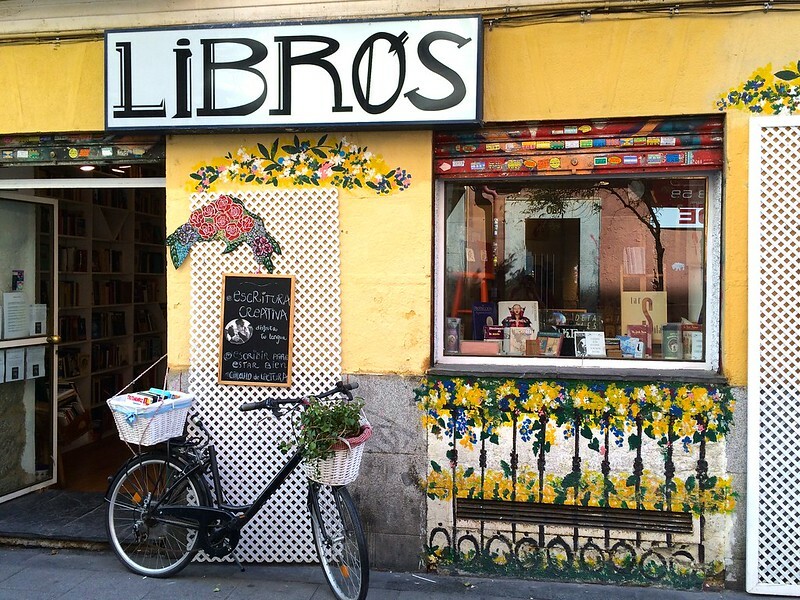 Check out my Perfect Sunday in La Latina, complete with a trip to the Rastro, here. 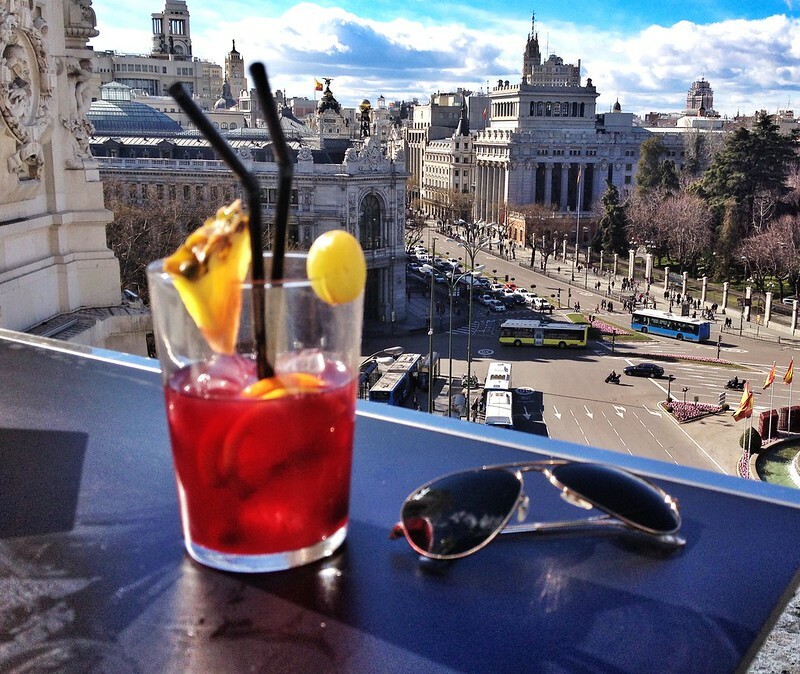 Have more than just one day in Madrid- be sure to check out Devour Madrid Tours! I’m a big fan of exploring a new place through my tastebuds- I mean is there really any better way to get a true feel for a new culture? These local experts will take you off the beaten path to experience the best of Spanish culture and cuisine. I used to intern for them, and could not recommend their tours enough! 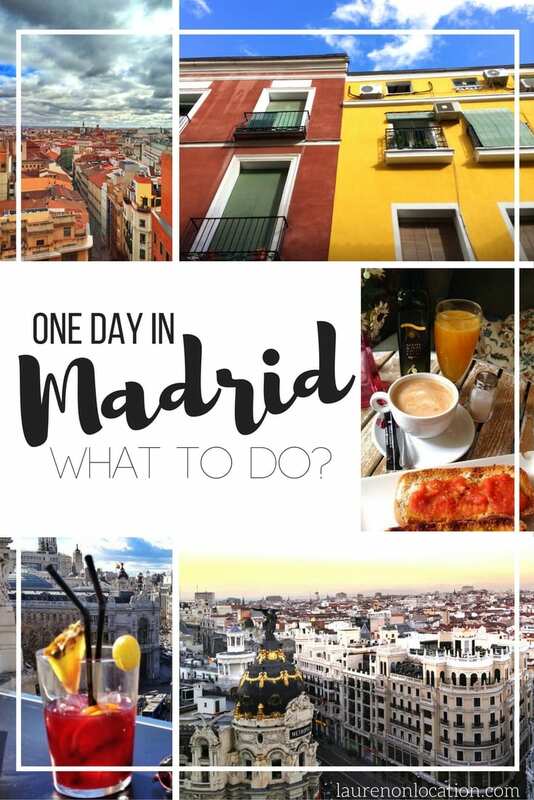 Love this, Lauren 🙂 It’s so cool to read about all of the different things to see and do in Madrid at different times in the day, and I of course love that many of the things are food related 🙂 The more I read both yours and Courtney’s blogs, the more I think Madrid is worth a visit! If only I could keep it my home … like forever! I’m happy you felt at home in Madrid!! Of course Abby! I hope you can come to Madrid and experience it for yourself!! I love this post!! Personally, my favorite cities have all been the ones without any famous landmarks, and rather just exploring it and eating the food are the fun parts. I’ve heard people say Madrid is boring but all of this looks SO appealing to me, especially the food (even the toast with tomatoes). 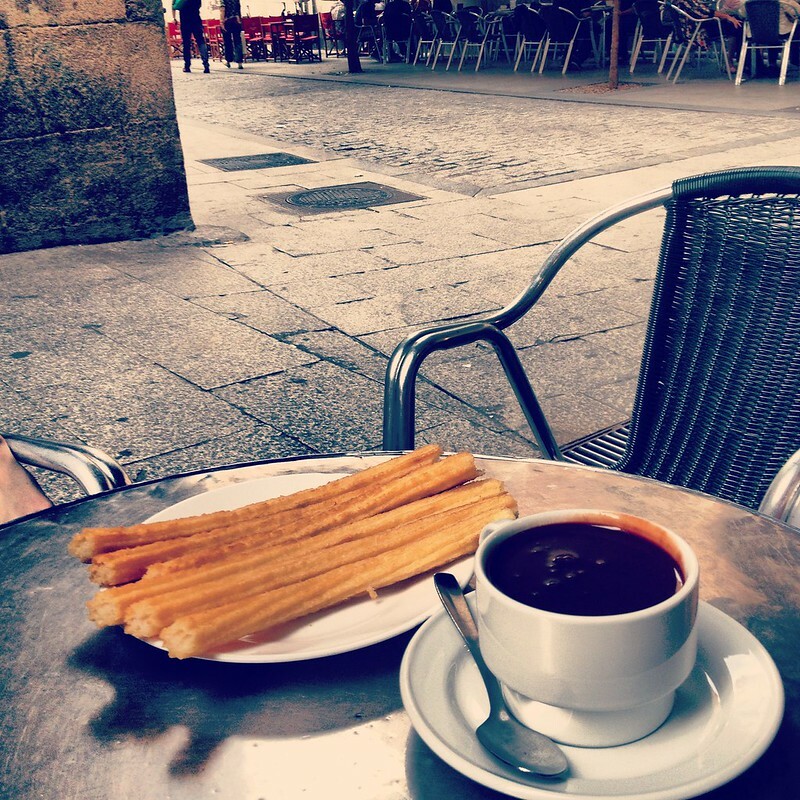 My mouth is watering at the thought of tapas and churros & chocolate. I’m definitely going to pin this for when I make it to Spain! I hope you make it to Madrid soon Anna! I know the food scene is calling your name 😀 Anyone who says Madrid is boring just didn’t get to know the city that well. Madrid is anything but boring! And you’re right, I tend to have the best memories about the cities that I eat my way through! 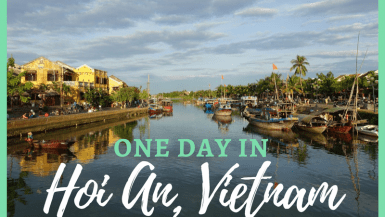 Love this super comprehensive guide – my favorite things to do are eat and wander aimlessly, so it’s perfect. Thanks for the specific suggestions! Bookmarked! This is great! Spain is definitely high on my list and hopefully I will get to use your guides soon! Thank you from the bottom of my heart for this post, Lauren. My husband and I had one day in Madrid with very cold weather on Thursday. Thanks to you we managed to plan a fine day. We did explore a neighbourhood with a market, we got to Retiro Park in the afternoon and in between we experienced menu del dia at Momo! That was the jewel in the day. Their website is easy to use for booking. The service and food were excellent beyond words. Thank you so much for sharing your knowledge of the city. Thanks so much for this Lauren! We’re going to be in Madrid next week and plan to follow your itinerary. I was wondering if you have a suggestion for things to do after dinner – good places to hear music or go dancing, etc. We’re not 20-somethings but we still like to go out 🙂 Thanks!! This post was so amazingly helpful!! Literally going to follow it to the T. Thank you! !